Little Miss Moneybags: Spa Week Giveaway 1 Winner! 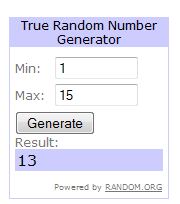 We have a winner for Spa Week Giveaway 1! That makes the winner Jenny! Send me an email at littlemissmoneybags at gmail dot com and we'll get your package on its way. Congratulations! If your name didn't get drawn, don't forget to enter Giveaway 2!